The finishes at this tournament have tended to be exciting, but Matabeleland Tuskers' last-ball win over Mid West Rhinos at Harare Sports Club could claim to be the most thrilling yet. A late fightback by Tuskers in pursuit of Rhinos' 152 for 8 set up a dramatic final over, with Keegan Meth needing to score three off the final delivery. He drove firmly but almost straight to Ed Rainsford at extra cover, but the hapless fielder somehow let the ball slip through and reach the boundary, and Tuskers snatched an unexpected two-wicket victory. Vusi Sibanda had been the mainstay of the Rhinos innings as the batsmen struggled against Chris Mpofu's pace and Gavin Ewing's guile. He added 74 with Malcolm Waller before being surprised by a full toss from Mpofu to be bowled for 61. In the same over Waller edged a catch to the keeper for 33 and after that only Ollie Rayner, with 24 off 14 balls, played with much intent, stroking three fours before he was caught in the deep off the final delivery. In reply, Tuskers' promotion of Sean Williams to open did not succeed, as he was yorked by Rainsford in the first over. Gavin Ewing, however, at last found some luck, racing to 40 from 28 balls before being trapped lbw by Graeme Cremer in the sixth over. 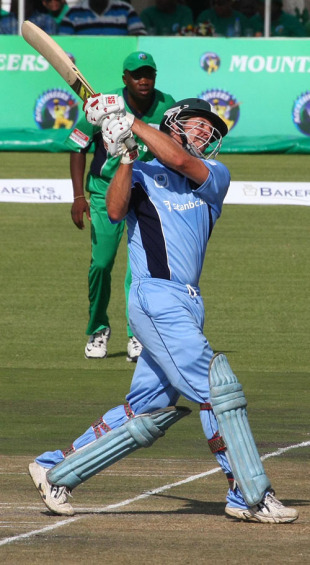 Tuskers struggled after his dismissal, until the fall of the fifth wicket for 76 in the 13th over brought Blignaut to the crease. When he lost Dion Ebrahim almost immediately and 60 were needed off the last five overs, it seemed Tuskers were sinking to yet another defeat. But Blignaut seized the initiative with a rapid 26, which included two fours and a six, before drilling a catch straight at cover. With 42 still needed from only 20 balls, Meth and Tawanda Mupariwa picked up where Blignaut left off to reduce the target to 11 off the final over. A brilliant stop by Riki Wessels at long on saved a six, and when Mupariwa holed out to long on off the penultimate ball, the match was brought to a thrilling climax off the final delivery. The second game of the afternoon was another closely-fought affair, with Mashonaland Eagles beating Southern Rocks by six wickets, thanks to powerful innings by Elton Chigumbura and Cephas Zhuwawo. Put in to bat, Rocks got off to a flying start as Chamu Chibhabha pulled the third ball, from Chigumbura, for six and 13 came off the first over. Rocks raced to 44 in five overs, with Chibhabha receiving good support from Sikandar Raza. Raymond Price put a brake on the scoring, but the 100 came up in the 13th over. Raza was finally tempted into an indiscreet drive by the Doug Marillier's offspin, and was caught at long off for 38 in the 14th over. His dismissal sparked a mini collapse as Chibhabha aimed a wild heave at the very next ball and skied a catch to backward point to be out for 61. To complete a hat-trick of dismissals Sean Ervine then ran himself out as Rocks slipped to 111 for 3. Alester Maregwede and Steve Tikolo added 57 in the six remaining overs, with Tikolo run out off the final ball, but considering their superb start, the final total of 168 must have been a little disappointing for Rocks. Eagles stumbled in their chase, with Marillier run out for a single after a mix up, and Prince Masvaure stumped, before Zhuwawo and Chigumbura combined in explosive fashion to put the pressure back on the bowling side. Chigumbura, who has been on top form with the bat in this tournament, plundered 41 from 27 balls, hitting five sixes - but no fours - before he was caught on the square-leg boundary. Eagles were well placed at 115 for 3 in the 13th over, but lost some momentum after the wicket and 27 were needed off the final three overs. With 17 needed Lamb was caught at cow corner and Forster Mutizwa came in to face another tight finish. He responded by pulling the first ball he faced for a big six, and Anthony Ireland was brought on to bowl the final over. Mutizwa managed a boundary, and after three singles Zhuwawo sealed the match with a lofted drive over extra cover. He was named Man of the Match for his unbeaten 52-ball 81, which included six fours and four sixes.